Rebetiko is a popular genre of Greek urban music, which was formed at the beginning of the 20th century. In 1923, Greece was faced with the resettlement of over 1.5 million Greeks from the Asia Minor area. Greek poor class of workers had a strong contact with the refugees and their culture. The musicians of these two cultures were spontaneously exchanging musical ideas and as a result – Rebetiko was born. George Semkos is a modern musician from Thessaloniki. He plays Rebetiko songs almost every day during his free walking tours. George likes to joke that this part of the excursions is understandable for everyone. Rebetiko was always in the life of Greek people. It is a symbolic picture of the specific world and of hard times in Greek history. “Rebetiko is the music of free people. They wanted to express themselves, not to change society. Politicians hated Rebetiko, especially communists and fascists because they were afraid of free minds. But I want to be myself.” – George Semkos. It was approximately 7 years ago, when George started to actively play Rebetiko music. “I was getting more deep into this world. At the beginning it was like sense, now it is knowledge.” – George Semkos. 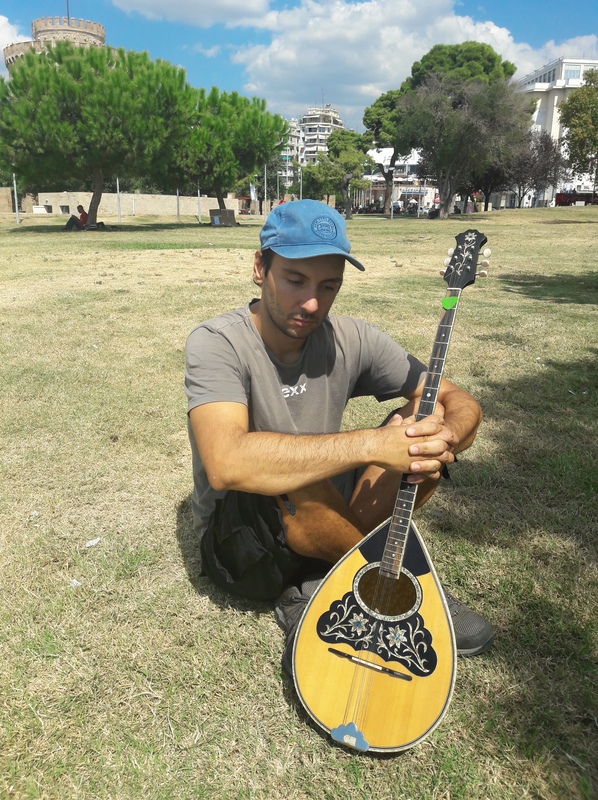 Bouzouki is the special instrument for playing Rebetiko. The name bouzouki comes from the Turkish word bozuk, meaning “broken” or “modified”. The unique sound of this instrument reminds voices from the human’s soul, as usual, filled by sorrow or despair. “Topics of songs are different– it depends on your mood and what do you feel in the moment. Rebetico can cover many different feelings and situations but human is always in the center of Rebetiko.” – George Semkos. Sometimes the Rebetiko songs have a smell of criminal: drugs, police, prison… In general, this kind of urban music showed things which are eating men’s heart. “For me, it is the most honest music, they do not hide themselves. Workers were escaping from hard real life by playing music. They did not afraid to expose what they had inside, even their weaknesses.” – George Semkos. Rebetiko – music from the underground, which appeared in cities and still lives in their streets. This part of Greek culture teaches us to be ourselves in any moments of life and to be brave to say about what we are thinking. Hey! I am Kateryna from Ukraine. My favorite topics are art, especially theater, books, and music. Also, I like to write about social and ecological issues.